A requirement for understanding morphogenesis is being able to quantify expansion at the cellular scale. Here, we present new software (RootflowRT) for measuring the expansion profile of a growing root at high spatial and temporal resolution. The software implements an image processing algorithm using a novel combination of optical flow methods for deformable motion. The algorithm operates on a stack of nine images with a given time interval between each (usually 10 s) and quantifies velocity confidently at most pixels of the image. The root does not need to be marked. The software calculates components of motion parallel and perpendicular to the local tangent of the root’s midline. A variation of the software has been developed that reports the overall root growth rate versus time. Using this software, we find that the growth zone of the root can be divided into two distinct regions, an apical region where the rate of motion, i.e. velocity, rises gradually with position and a subapical region where velocity rises steeply with position. In both zones, velocity increases almost linearly with position, and the transition between zones is abrupt. We observed this pattern for roots of Arabidopsis, tomato (Lycopersicon lycopersicum), lettuce (Lactuca sativa), alyssum (Aurinia saxatilis), and timothy (Phleum pratense). These velocity profiles imply that relative elongation rate is regulated in a step-wise fashion, being low but roughly uniform within the meristem and then becoming high, but again roughly uniform, within the zone of elongation. The executable code for RootflowRT is available from the corresponding author on request. C. Weele, H. Jiang, K. K. Palaniappan, V. B. Ivanov, K. Palaniappan, and T. I. Baskin. 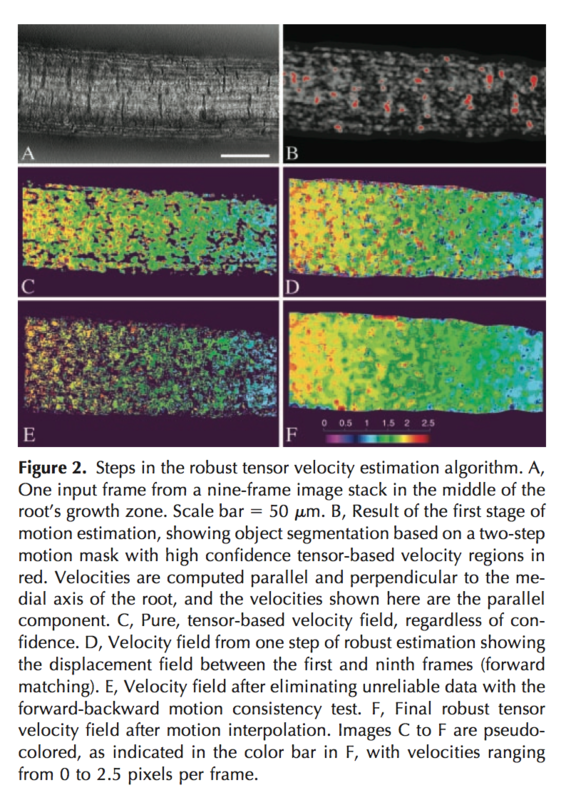 A new algorithm for computational image analysis of deformable motion at high spatial and temporal resolution applied to root growth: Roughly uniform elongation in the meristem and also, after an abrupt acceleration, in the elongation zone. Plant Physiology, volume 132, issue 3, pages 1138--1148, July 2003.